In demand and as highly esteemed as ever: only a few booth locations are still available for the Optatec international trade fair for optical technologies, components and systems. The industry event will bring manufacturers and users together at the international Frankfurt Exhibition Centre from the 15th through the 17th of May. A supplementary programme including forums, presentations and workshops with world-class speakers will be provided for those who wish to expand their knowledge or establish new contacts at the globally leading event. The highly popular, annual exhibitor forum is already booked out! Amongst other features, special attention will be focused on the Science Slam held by OptecNet on Tuesday, where knowledge will be presented in a new format in an entertaining manner. The Optical Systems Conference will be an absolute highlight, and will take place concurrent to the trade fair. Everyone who’s anyone will meet here. For example, a presentation will be held by a well-known Microsoft employee. The accompanying conference will be organised by SPIE Europe. Nor will the fields of human resources recruiting, basic training and further training be short changed at Optatec. The “Study Photonics” training and research technology park will be held by five highly committed German universities. Primary attention will be focused on target groups including pupils and students. The workshop dealing with DIN ISO 10110-7 and DIN ISO 14997 will also be interesting for expert visitors: “Surface imperfections: Test methods and specifications in drawings”. Optence will also present an introduction to the complex issue of surface coatings. 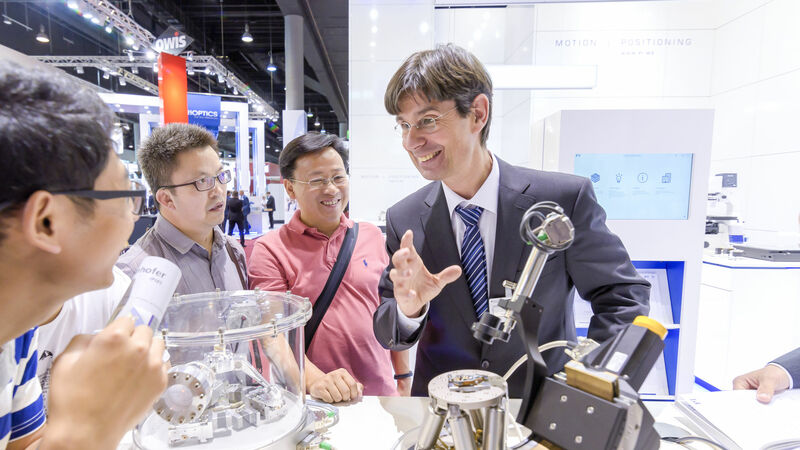 With exhibitors from 32 countries – more than half of the participating companies come from outside of Germany – the industry meet attracts more than 5500 expert visitors to Frankfurt. Consistent alignment to practical application is one of Schall’s recipes for success. Alone Optatec focusses on R&D, production, assembly and quality assurance within the broad range of optical technologies and all relevant process sequences. The event which covers a broad spectrum of optical technology applications and has enjoyed 14 successful editions thus far, doesn’t want to nail itself down to a single subsector. Whether photonics, bio-photonics or photovoltaics, solar, laser and medical technology as well as test technology, image processing and vision systems, or materials processing and generative 3D manufacturing are concerned– all optical technologies, components and systems are on hand at the Frankfurt Exhibition Centre. “We feel that Optatec’s alignment has been confirmed by its success. Optatec is growing from year to year and has never been as well-off as it is today”, says project manager Karin Waldow happily. Not least of all, the longstanding loyalty of many technology leaders verifies the event’s alignment as well. These companies frequently register for the next event immediately after the trade fair, where they often present their new products to a broad-based international audience for the first time ever.